Neuropathy means nerve damage. 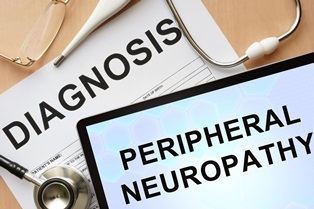 People who suffer from peripheral neuropathy have a condition that affects how their brain and spinal cord (the central nervous system) communicates with the nerves in the rest of the body (the peripheral nervous system). According to the National Institute for Neurological Disorders and Stroke, approximately 20 million people in the United States suffer from peripheral neuropathy. These conditions can cause different types of neuropathy. Mononeuropathies (damage to only one nerve). Polyneuropathies (damage to more than one nerve). Motor nerves. If your motor nerves are damaged, then you could suffer from muscle weakness, cramps, twitching, muscle atrophy, and changes in your reflexes. Sensory nerves. Sensory nerve damage can cause changes in the way that you experience sensation and feel pain. This can be dangerous because you may not know when you are hurt. Autonomic nerves. Autonomic nerves may impact how your body works. Your internal organs may be impacted resulting in your inability to control your bladder or breathe independently, for example. Additionally, you may have difficulty regulating your blood pressure and body temperature. The specific symptoms that you suffer and the impact on your life depends on which nerves are affected and how severely they are damaged. What Symptoms Do People With Neuropathy Suffer? Each of these symptoms can have a tremendous impact on your ability to work. In severe cases, you may be unable to breathe independently, unable to digest food, unable to walk, or unable to talk, for example. Peripheral neuropathy can be both painful and debilitating. If your peripheral neuropathy is caused by a treatable condition and is only temporary, then you will not be eligible for Social Security disability benefits. However, if your peripheral neuropathy is caused by a condition that cannot be managed or cured and, as a result, you suffer from a permanent disability that prevents you from working, then you may be able to recover Social Security disability benefits. Applying for Social Security disability for neuropathy is not easy. You have to have a clear understanding of how the Social Security Administration reviewers decide whether or not you can work, and whether or not your symptoms are severe enough to qualify you Social Security disability. When you work with a Social Security disability lawyer, you put someone experienced and knowledgeable in the law on your side. Our team works closely to guide you through the application process to ensure you include all of relevant information on your application. With our help, you increase your chances of getting the benefits you need while easing the confusion of filling out the application on your own. If you are ready to get started on your application for Social Security disability for neuropathy, contact us today using the contact form on this page or call us directly for a free consultation. We can help take the stress out of applying for Social Security disability benefits and we can fight to get you the benefits that you have earned.